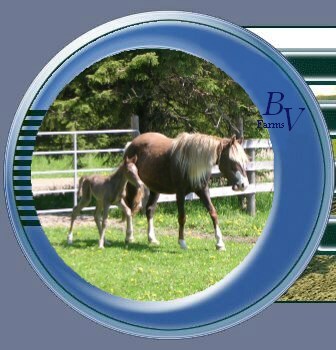 At Bonnie View Farms we have selected our mares to express a variety of colours, heights, & builds. While all of our mares are equally lovely, they are each quite unique in their own way. We'll let you choose a favorite, because we sure can't! At Bonnie View Farms our breeding mares are our pride and glory! Our “girls” aren't “just broodmares”, they are well trained riding horses too! Our mares are riden between and throughout much of their pregnancies, and even with their foals at their sides too! 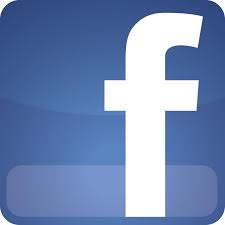 Often participating in trail rides, over-night camping, demos, horse shows, clinics, riding lessons, etc. You name it these ladies can do it! Diana is a certified RMHA mare, (DOB 4/17/01). She has a milk chocolate coat, and a long, curly, white mane & tail. She stands 14.3hh, with a solid, compact build. Diana has an exceptionally calm, patient nature, especially with children, and a natural, easy gait. Her bloodlines include the famous stallions “Johnson's Toby”, “Buddy Roe” and “Tobe”. On August 5th 2018 Diana foaled a stunning chocolate filly by our gorgeous jet black stallion “BVF's Jedi Knight ” . Diana is currently taking a little time to enjoy life as a riding horse; trail riding, camping, showing, and having fun! 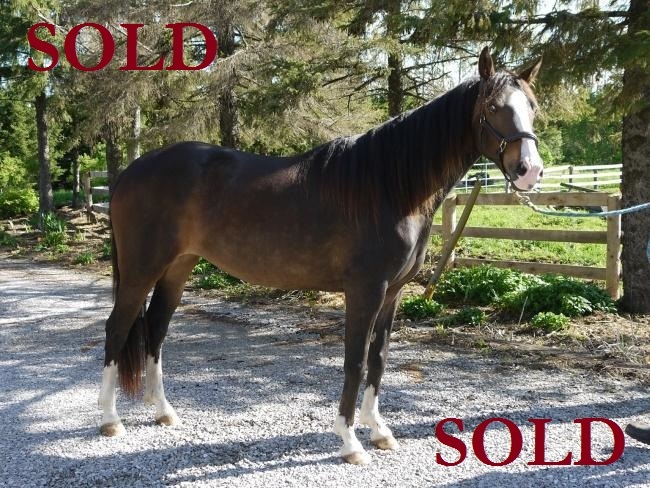 Bonnie is a double certified RMHA/KMSHA bay mare (DOB 05/03/07). She has a rich mahogany coat, with a long, thick, gorgeous mane & tail, and tons of chrome! Bonnie stands 15.1hh, with a strong, muscular, but lovely, feminine build. She has a friendly, inquisitive nature and a wonderful, loving personality. She is also incredibly smart, and a very quick learner too! Bonnie is of the “Doc Holiday”, “Sewell's Sam” and “Tobe” bloodlines. She's one gorgeous, flashy girl! On May 4th 2017 Bonnie foaled a stunning red chocolate colt by our handsome chocolate stallion “BVF's Tribute Kidd” . Once again, Bonnie is confirmed pregnant to our handsome chocolate stallion “BVF's Tribute Kidd” for a 2019 foal. Splash is a double certified SMHA/ICHR gold champagne tovero mare (DOB 03/20/08). She stands 15.2hh, with a big, strong, solid build. Splash has a kind, inquisitive, and very loving nature, combined a super smooth, flashy gait. She's also an extremely calm, laid-back, easy-going kinda girl! Splash's bloodlines include the famous stallions “Rainbow's Dandy Man”, “Angel's Go Boy”, “Suns Stormy Night”, and “Ebony's Class Act”. She's one outstanding mare sure to make a 'splash' everywhere she goes! Splash is currently taking a little time to enjoy life as a riding horse; trail riding, camping, showing, and having fun! We plan to breed Splash for a 2020 foal. Déjà is a triple certified RMHA/KMSHA/ICHR gold champagne mare, (DOB 5/11/08), a very rare colour in the Mountain Horse breeds. She stands 14.3hh, with a solid, compact build. Déjà is incredibly loving and sweet, with a very inquisitive, people-oriented nature. Déjà is a younger, full sister to our mare Dolce; in fact these sisters are so much alike they could almost be identical twins! Her bloodlines include the famous stallions “Toco Sam”, “Sewell's Sam” and “Tobe”. Any foal of Déjà's is sure to be exceptional! On May 17th 2018 Déjà foaled a beautiful red chocolate filly by our gorgeous grulla (black dun) stallion “BVF's Remington Steel ” . Déjà is currently taking a little time to enjoy life as a riding horse; trail riding, camping, showing, and having fun! We plan to breed Déjà for a 2020 foal. On April 18th 2017 Rain foaled a gorgeous jet black filly by our gorgeous jet black stallion “BVF's Jedi Knight ” . Once again, Rain is confirmed pregnant to our gorgeous jet black stallion “BVF's Jedi Knight ” for a 2019 foal. Cadence is a double certified RMHA/KMSHA chocolate buckskin mare, (DOB 04/15/12). She has a rich butterscotch coat with chocolate points, and a blond mane & tail. Cadence will mature around 14.3-15.0hh, with a strong, muscular build. She has a sweet, friendly, and incredibly curious nature. Cadence's bloodlines include the famous stallions “Choco Dock”, “Buddy Roe”, “Yankee”, and “Tobe”. What a unique little darling she is! 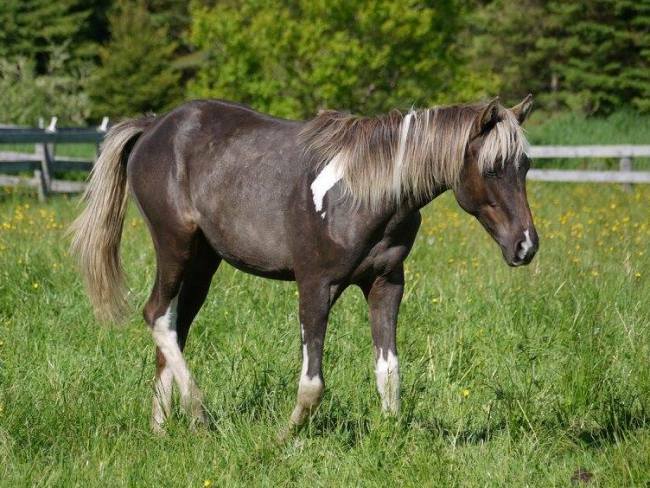 Cadence is confirmed pregnant to our gorgeous grulla (black dun) stallion “BVF's Remington Steel ” for a 2019 foal. 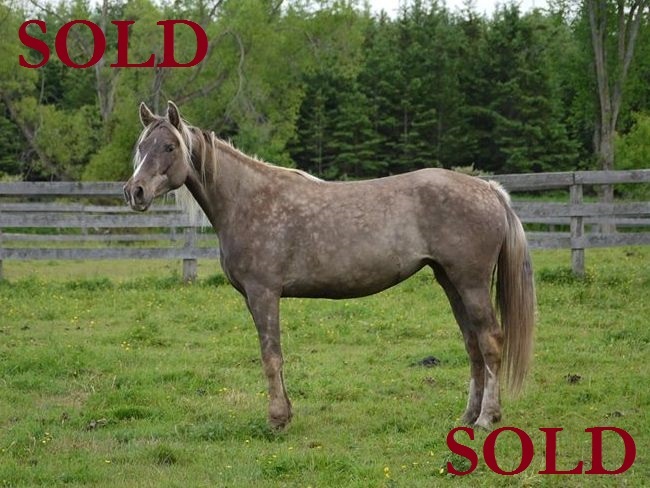 Valkyrie is a double registered RMHA/KMSHA chocolate mare, (DOB 05/12/14). She has a dappled milk chocolate coat, with beautiful long, thick, blond mane & tail. Valkyrie will mature around 15.1-15.2hh, with a large, powerful build. She has a very calm, sensible, and loving nature. Valkyrie is also incredibly brave too; on her very first ride under saddle she calmly walked off the farm property solo to the roads where she encountered several vehicles, including a huge machinery transport, without even so much as second thought! Valkyrie's bloodlines include the famous stallions “Johnson's Toby”, “Storm Warning”, “Maple's Squirrel”, and “Sewell's Sam”. This mare is one gorgeous girl! Hope is a gorgeous chocolate RMHA/KMSHA yearling filly, (DOB 05/22/16). Hope is just beautifully put together; she is tall & leggy, with a big, strong, solid build! She is of the “Dock”, “Barlow Chief”, “Buddy Roe”, and “Johnson's Toby” bloodlines. Not even 1 day old and this young lady was already outside gaiting up a storm, and just like her sire Jedi what a super smooth gait it's going to be! Hope is also going to be a jaw-dropping dark chocolate with snow white mane & tail; just like her older brother Rhythm! Watch out boys, she's got the look! Diva is a 2 y.o. 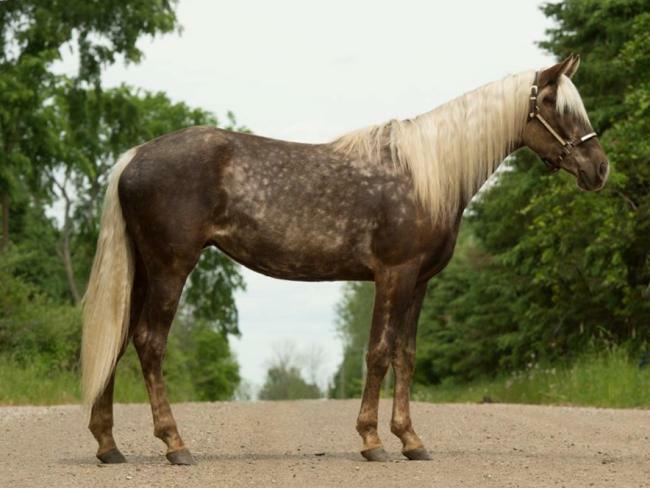 registered SMHA chocolate minimal tobiano filly, (DOB 04/29/16) She has a dappled chocolate coat, blond mane & tail, and the most beautiful lightning-strike style white markings! Diva is one lovely lady; beautifully put together and incredibly elegant! She will mature around 15.2hh, with a large, powerful build. Diva is a real people-horse too; she runs right up to you in the field and just loves to be around people. She will go anywhere and do anything you ask, and takes every new challenge in stride. And what a big, graceful gaiting stride it is too!! China is a 2 y.o. double registered RMHA/KMSHA chocolate mare, (DOB 05/31/16). She has a rich chocolate coat, with super long, incredibly thick, snow-white mane & tail. As only just a yearling China's mane had already grown so long it was down well past her shoulder! She has outstanding conformation and will mature around 15.1-15.2hh, with a large, solid build. China has a sweet, loving and docile nature. Her's bloodlines include the famous stallions “Johnson's Toby”, “Storm Warning”, “Toco Sam”, and “Kilburn's Chocolate Sundown”. This little darling is absolutely stunning! 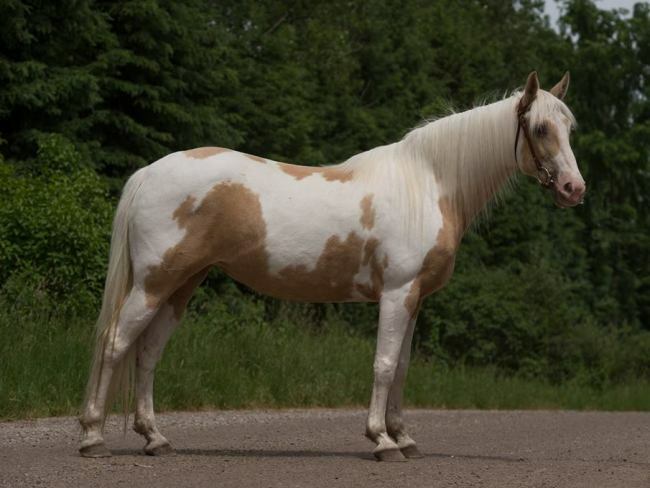 Dolce (pronounced dôl-che; Italian for sweet) is a triple certified RMHA/KMSHA/ICHR gold champagne mare, (DOB 5/11/04), a very rare colour in the Mountain Horse breeds. She stands 15.1hh, with a solid, compact build. Dolce has a sweet, sociable personality and is as unique as her colour. Our “Blond Bombshell” is also famous for her incredible 30mph speed rack! Her bloodlines include the famous stallions “Toco Sam”, “Sewell's Sam” and “Tobe”. On April 30th 2017 Dolce foaled a beautiful jet black filly by our handsome chocolate stallion “BVF's Tribute Kidd” . 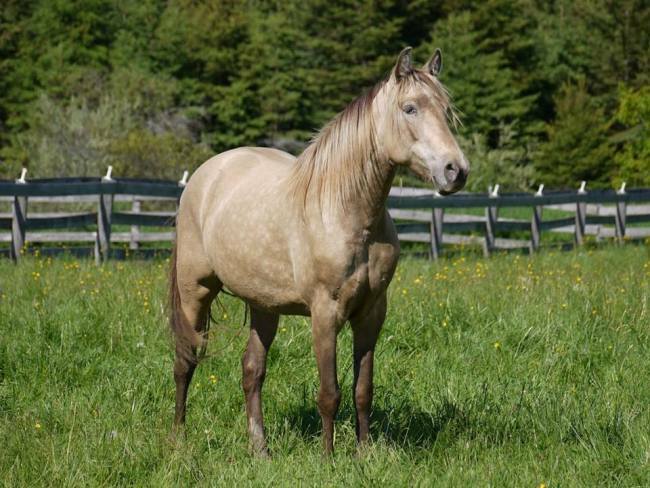 Misty is a gorgeous certified KMSHA mare, (DOB 5/21/99), with a milk chocolate coat and long, thick, blond mane & tail. She stands 14.3 hh and has lots of chrome. Misty has soft, graceful lines, and a quiet temperment. Her gait is as smooth as it is effortless. Misty is of the “Johnson's Toby”, “Sam Clemon's Tim”, and “Tobe” bloodlines. Misty's 2010 foal is a handsome chocolate colt by the chocolate Canadian stallion “Ridgeview's Blue Frost” . Tommie is a certified RMHA dark chocolate mare, (DOB 11/19/00). She stands 15.2hh and has the solid grace of her grandsire “Dock”. Tommie has an animated, outgoing gait that matches her lively personality to a T. Her bloodlines include the famous stallions “Yankee”, “Squirrel” and “Tobe”. On April 27th 2013 Tommie foaled a stunning chocolate filly, by our very own handsome chocolate stallion “BVF's Tribute Kidd” . Néra is a double certified RMHA/KMSHA jet black mare, (DOB 5/5/01). She stands 15.0hh with a compact, feminine build. Néra exemplifies the breed standard of the Rocky Mountain Horse in every way, from her gentle temperament to her natural, easy-ambling four beat gait. Her bloodlines include the famous stallions “Dock”, “Sam Clemon's Tim” and “Tobe”. Néra's 2013 foal is a gorgeous grullo colt, by the rare grullo (black dun) American stallion “Stardust's Steely Dan” . Amber is a double certified RMHA/KMSHA chestnut mare, (DOB 3/24/04). She stands 15.3hh, with the size and presence of her grandsire “Storm Warning”. Amber has a kind, inquisitive nature and a gait that's smoother than satin, and just as effortless too. Her bloodlines include the famous stallions “Nuncio”, “Yankee” and “Johnson's Toby”. Any foal of this gorgeous mare is bound to be stunning! On April 27th 2012 Amber foaled a handsome chocolate colt by our very own gorgeous jet black stallion “BVF's Jedi Knight ” . Mercedes is a double certified RMHA/KMSHA red chocolate mare, (DOB 5/31/04). 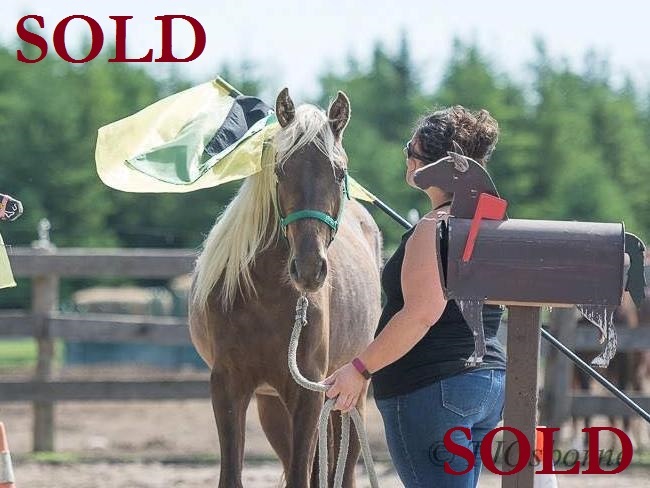 She has a bleach blond mane & tail, and she stands 15.1hh. Mercedes has a super smooth gait, a flashy, flirtatious nature and looks to boot! Her bloodlines include the famous stallions “Choco”, “Sam Clemon's Tim”, and “Blue Smokin Sambo”. On April 24th 2013 Mercedes foaled a beautiful chocolate filly, by our very own handsome chocolate stallion “BVF's Tribute Kidd” . Sassy is a certified KMSHA gray roan mare, (DOB 8/7/07), a unique combination of both the gray and roan genes. She stands 14.3hh with a solid, compact build. Sassy has a steel gray coat with stunning black points, and an exceptionally long mane & tail. Sassy has a delightful, loving personality, and true to her name a little bit of sass! Sassy's bloodlines include the famous stallions “Choco Dock”, “Dan's Dusty Action” and “Tobe”. On May 22nd 2014 Sassy foaled a stunning chocolate roan + gray colt, by our very own handsome chocolate stallion “BVF's Tribute Kidd” .